Rents are at an all-time high, newcomers and young people can’t afford to live in the city, and people who need subsidized and supportive housing are being left in the cold. From affordability problems and precarious housing to homelessness across the region – housing is a big issue in the GTHA, that requires a government response. We have new political leaders, strategies, and housing talk at all 3 levels of government – so what’s next? National Housing Week, Nov 19 – 23, is an opportunity to talk about these issues. In a panel discussion, moderated by Dr. Kwame McKenzie, CEO of Wellesley Institute, housing experts with a range of experiences tackle these issues head-on and share their #1 idea for what the city, province or federal government should to do right now to address the housing crisis. Light refreshments will be served. Register now. This event is free but registration is required. Doors open at 6:00 p.m. 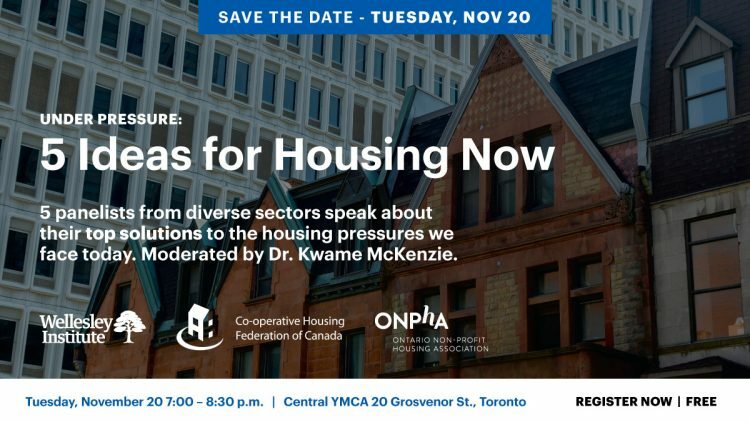 This event is proudly co-presented by Wellesley institute, Co-operative Housing Federation and Ontario Non-Profit Housing Association. Pedro Barata is United Way’s Senior Vice President, Community Impact & Strategy. Pedro’s work and extensive volunteer activities in the non-profit sector span two decades, focused on public policy, community organizing and communications. During this time he’s worked with community partners and advised all levels of government on social policy related to: poverty reduction, income security reform, housing and homelessness, as well as community benefits initiatives. Simone Swail is the Manager of Government Relations for the Co-operative Housing Federation of Canada (CHF Canada) which represents over 900 housing co-ops across Canada, home to over 250,000 people. She works with other housing stakeholders and members to raise the profile of affordable housing issues and advocates for better housing policies from all levels of government. She played a key role in the campaign to secure ongoing subsidies for low-income members in federal housing co-ops and this spring collaborated with Ontario Non-Profit Housing Association to create an Affordable Housing Plan for Ontario. Stephen Gaetz, Order of Canada, is the director of the Canadian Observatory on Homelessness COH and a professor at the Faculty of Education at York University in Toronto, Ontario, Canada. Dr. Gaetz has enhanced pan-Canadian collaboration between stakeholders interested in homelessness research in Canada. Lori-Anne Gagne joined “Vic Park” in August 2014 bringing with her almost 30 years of experience in the social housing sector through various organizations and perspectives. She began her social housing career in 1986 when she joined a development consulting firm in Northern Ontario. Since joining Victoria Park in 2014, Lori-Anne has led the complete regeneration of 2 towers containing 437 units, finalized an amalgamation with another non-profit and laid the groundwork for a new development which will begin construction in early 2019.